Long before commercial doll manufacturers made what we usually reference as antique dolls, folks were fashioning like playthings from simple cloth. Scraps left over from a diligent sewing session would often lead to a new doll for a child. In fact, it's pretty safe to say that as long as people have been wearing clothing, they've been making rag dolls. While rag dolls are quite simple compared to fancier antique dolls made of porcelain, wax, or other materials, cloth dolls have never lost favor with children. They are still functional toys that can be carried around and played with endlessly, patched up with love, and played with again. With their scrappy look and button eyes, it's no mystery why these cuddly playmates are called rag dolls. But what do you think of when the phrase "rag doll" comes up? For many people, it's all about Raggedy Ann. After all, she's been delighting children for more than 100 years now. This story began when cartoonist Johnny Gruelle refurbished a faceless rag doll his daughter, Marcella, found in her grandmother's attic. He also gave the doll an apropos name: Raggedy Ann. 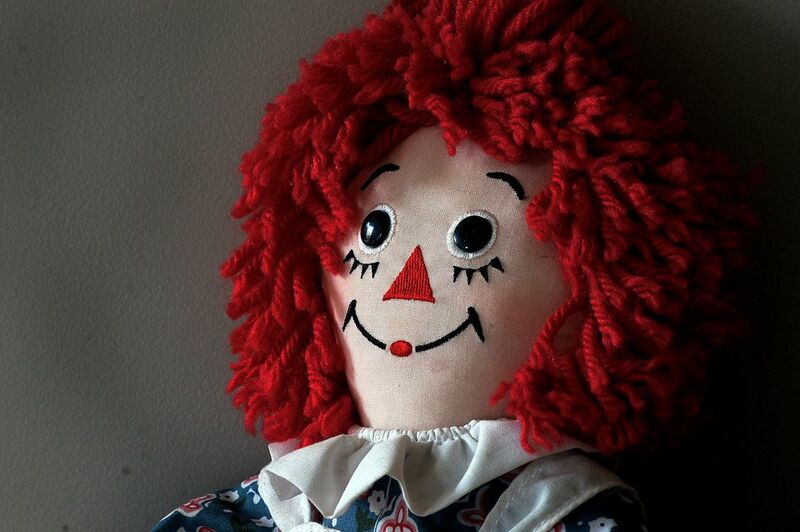 Marcella fell in love with Raggedy Ann, and the two became inseparable. But it wasn't until after his daughter fell ill and passed on that Gruelle began writing children's books based on the doll's character. The first mass-produced Raggedy Ann dolls were based on the books. While they look similar to modern examples, the early versions had brown yarn hair (instead of red) and shoe-button eyes sewn in place as shown above. If you happen to own a doll with dark brown hair produced by Volland with a mark reading “Patented Sept. 7, 1915,” you've got a treasure that could be worth more than $1,000. This is a very early Raggedy Ann example coveted by many ardent doll collectors. Other early names to look for on Raggedy Ann dolls are Molly-'es Doll Outfitters and Georgene Novelties. Molly-'es manufactured these dolls from 1935-1938, and then Georgene took over from 1938-1963. All these examples have red hair and printed features on the faces, but can still be worth more than $200 each in good to excellent condition. Even Knickerbocker Toy Company's Raggedy Ann, produced from 1963 to 1982, can be worth more than $100 for a 36-inch doll. And we can't forget Raggedy Ann's friends, some of which are quite collectible. Gruelle created a host of characters to keep Raggedy Ann company in his books. From her playmate Raggedy Andy and the Camel with Wrinkled Knees to Beloved Belindy and Uncle Clem, all the characters ended up being immortalized in ragdoll form. The most costly of these dolls today is Beloved Belindy, a mammy type caricature complete with head rag. Because of Black Americana collectors' interest in this doll, prices usually start at several hundred dollars and go up from there. Although Raggedy Ann and friends make up a good portion of the secondary rag doll market, they're not the only collectible cloth dolls around. Some people scavenge flea markets and auctions for Topsy Turvy dolls as well. These female dolls have two cloth heads, one of which is hidden under a long skirt at any given time. Some of the oldest Topsy Turvy dolls have one black head and one white head. It's said that these dolls were made by African-American women who worked for while families, some of which lived on plantations. Black children weren't allowed to play with white dolls, so the head displayed depended on the race of the adults who happened to be nearby. Of course, if you run across a faceless rag doll, it might be an Amish example. This religious group allowed children to play with dolls but did not allow them to have faces to avoid breaking the Biblical graven image commandment. Children will be children, however. Some Amish youngsters would pencil in faces on their dolls and then erase them before an adult came around to find them out. Even Steiff, a company better known for its wonderful bears and stuffed animals, made several cloth dolls. These were usually well made of felt, plush, or velvet. They also have high-quality button eyes and painted features in line with their other products. Mama Katzenjammer, Golliwog, and even Mickey Mouse can be found with Steiff labels. These are all very collectible and priced at more than $1,000 apiece nowadays when found in very good to excellent condition. Of course, some of the most beloved rag dolls weren't fashioned to resemble a recognizable character at all. Whether they were handcrafted or machine made, they once pleased children and now reside in the homes of some very appreciative collectors. Other examples of collectible dolls you might want to read about include Madame Alexander Dionne Quints and Buddy Lee Dolls. All of them are considered collectibles, and fetch high prices if you have the right one.